A Lifelong Investment For a confident Smile! Dr. Parveen Sultana, offers Dental Implants in Chester Springs PA and Downingtown PA 19425. We provide affordable and quality dental implants for all age groups with no downtime. Top Rated Local® Dental Implants. Dr. Parveen Sultana provides permanent tooth replacement for patients in Chester Springs, Downingtown, Exton, Glenmoore, and the greater Chester county area. The treatment process starts with a patient intake session to diagnose individual dental needs and create a custom treatment plan. The Implant: This is a screw that directly connects to your jaw and acts as a root for your replacement tooth. In some situations, bone may need to be grafted before the implant can be installed. An Abutment: Part of the implant that secures the prosthetic tooth. Crown: This is the actual prosthetic tooth. It is made of porcelain, zirconium, or another dental material and is prefabricated in a dental lab so that it fits perfectly with your natural teeth. This technology can replace one tooth or multiple teeth. They are often the best permanent solution for people who have failing teeth and other dental problems. Additionally, this type of treatment has a very high success rate for patients. About 98% of implants last for the rest of a patient’s life, where root canals, bridges, and other replacement options typically need to be addressed 5 to 10 years down the road. 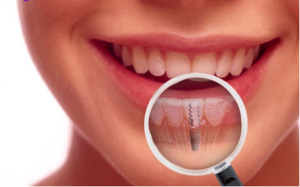 The All-on-4 Dental implant procedure is also known as endosseous implant or fixture is a dental procedure that anchors (small screw) to the jawbone to support a dental prosthesis such as a crown, bridge or denture. The small screw acts as a replacement tooth root. Dental implants are often used to retain artificial teeth, facial prosthetics or to act as anchor points for orthodontics. This procedure is a great way to correct a missing tooth. It can be for cosmetic reasons or because it affects your speech or chewing. When you have a missing tooth it can also create bone loss around the area of the missing tooth. If you lose your tooth by accident or disease there is a way to restore your smile. Dental implants are choice preferred by many people to eliminate the hassle of dentures, partial dentures and sometimes a choice for people that do not want to have to remove partial structure for a bridge. You can either have a single implant or several implants and also have implants put in to support a full set of dentures. The All-on-4 procedure provides a same-day, screw-retained and permanent replacement for a person’s complete lower and/or upper set of teeth. This procedure is ideal for patients who are suffering from a major amount of tooth decay or loss. It is also designed for patients who are not able to get dental implants because their jaw area has bone loss. Loss of teeth frequently occurs along with jaw bone loss. This creates the problem of having to reconstruct the jaw bone. If the implantation is going to be successful, bone from different parts of the body will need to be transplanted. It takes between three and six months for the technique of transplanting bone graft to be complete. Once this is finished, the implants can finally be placed. After placement of the implants has been finished, there is another two to three month waiting period. After this, the fixed prosthesis can be placed. Twelve months is the expected rehab time after the procedure. My fiance Chris brennan came in twice already and would highly recommend it. It's a very nice office with nice people. The Dr.does a great job explaining everything to you and her assistant it so very helpful. All in all great place to go! Dr. Sultana was great. She helped calm me, explained everything clearly and was even helpful with insurance/price info. HIghly recommend! Three members of my family have experienced the excellent services of Smile Care Family Dental. Dr. Sultana is very skilled and meticulous in her work while striving to make the visits as painless as possible. Her assistant Erica helps to create an upbeat friendly atmosphere. Furthermore, patients always receive follow-up inquiries concerning progress after each stage of dental work. One can be confident that teeth and gums will be cared for appropriately at Smile Care. Our Facebook Page. Like us!